Tribute records are being crapped out in the hundreds as of late and they are getting pretty bland but here is one done a little different. Of course the blues are the basis for everything that Aerosmith has ever done, so it is fitting that this tribute to the Bean Town boys goes south for some authenticity. Here you have an impressive mix of certified blues legends (Joe Louis Walker, David “Honeyboy” Edwards, Pinetop Perkins), mixed with a few notable rock and rollers, i.e., Lou Gramm and Marshall Crenshaw. Each artist takes Aerosmith on a walk down to the crossroads to seal that deal with the dark one and the sale of their souls for the music on this disc seems, to me, a bargain. Every track is easily recognized but none in danger of being confused with the Aero-original, or any one of the myriad of tribute versions already available for that matter. Picking favorites is pointless but I have to admit to a slight lean towards Pinetop Perkins’s completely original take on “Walk This Way.” Another plus for this disc is song selection -- the entire Aerosmith career is represented right on up to "Pink" with only the "Lighting Strikes" period omitted. If there were ever a tribute that was likely to get spun in the original artist’s player, this is it. 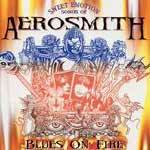 Honest, raw and infinitely beyond the standard tribute disc, The Songs of Aerosmith is as much a classic as anything Aerosmith has done themselves.